Is your business looking for a promotional product that is different to what your competitors are offering? Our Shiny PVC Credit Card Wallet is a great promotional tool and an excellent way to get your business name out in front of potential customers. Traditionally used as a marketing tool by banks, the PVC Credit Card Wallet can be used by any business. Available in four bright colours (that match our Shiny PVC Passport Wallets), it holds 10 cards in double sided clear PVC pockets and 2 cards in single sided pockets. With the PVC Credit Card Wallet you get two great logo printing options on two large spaces – both screen printing and deboss printing is available on two spaces of 55mm x 80mm giving you plenty of space to get your name out there. 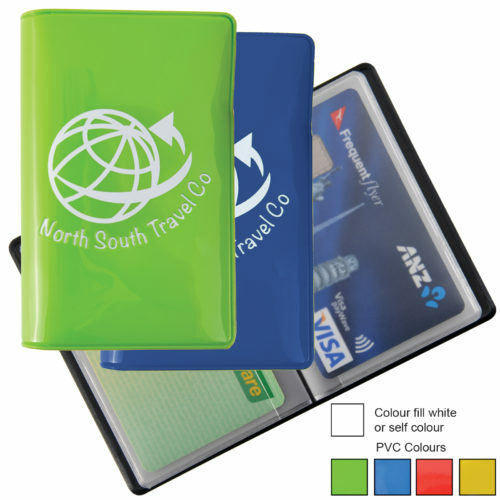 For a promotional product that’s different to your competitors, or to match with our Shiny PVC Passport Wallet, you can’t go past a branded Shiny PVC Credit Card Wallet. PVC credit card wallet, with 10 double sided clear PVC pockets and 2 single sided pockets. Holds 12 cards.